For many of us, Valentine’s Day is a good excuse to put on some red pumps, a cute dress and experiment with sultry makeup. However, finding the right eyeshadow palette for a date night can be daunting, given the plethora of options, price points, and colour ranges out there. During a romantic night out, you want to ensure that your shadow is not only durable and pigmented, but also fashionable and unique. After curating and reviewing many popular palettes, we have selected five splurge-worthy and versatile eyeshadow palettes perfect for a night out -- or perhaps staying in with the girls. The Modern Renaissance Palette by Anastasia Beverly Hills is one of Sephora’s most popular eyeshadow palettes for a reason. The romantic hues live up to their names and are perfect for creating a warm Valentine’s Day cut-crease. The formula is very pigmented and crease-free. Each of the shades is easy-to-blend, buildable and suit every skin tone. For an easy warm smoky eye, blend ‘Red Ochre’ into the crease with a fluffy eyeshadow brush and apply ‘Love Letter’ on the outer eye. 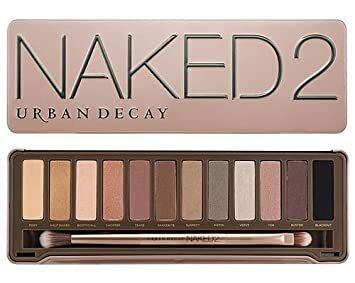 For a classic sultry eye, the Naked2 Palette by Urban Decay is your best bet. The essential eyeshadow palette comes with twelve taupe-hued neutral shades. The shadows are very velvety and rich, as well as pigmented. However, the range of finishes are limited to only two matte crease shades. Bonus: the palette comes with a double-ended shadow/blending brush. Want to spice up your daytime eyeshadow? The Sweet Peach Palette puts a fun twist on your everyday neutrals with several bronze-toned, pink and purple hues. The palette has a great range of shimmery and matte shadows, which have a buttery texture and are easy to blend. The matte shadows are perfect alone or as a transition shade. However, the palette does lack a few warm-toned shades. Bonus: The palette smells just like peaches! Morphe palettes are a makeup lover’s favourite for affordable yet top-quality eyeshadow palettes. The 35O Palette by Morphe Cosmetics provides a range of both warm shimmery and matte shadows for the price paid. The colours are very pigmented and vibrant, and suit every skin tone. The possibilities are endless when playing with this palette, whether it be creating a daytime look or a sultry date night look. Too Faced’s Chocolate Bar Palette is a perfect beginner’s palette if you are new to makeup or are experimenting with eyeshadow. The palette contains your essential neutrals and shimmers. The colours are very blendable and create an effortless glam look. Blend ‘Salted Caramel’ and ‘Semi Sweet’ into the crease for definition. Apply ‘Hazlenut’ on the outer V and ‘Marzipan’ on the lid and inner corner.